Most insects walk forward three legs at a time, a manner of locomotion known as the alternating tripod gait. But scientists have recently learned that there’s at least one insect, the industrious dung beetle, that moves along with a galloping gait — and they’re kinda perplexed as to why. So why would the dung beetle resort to this less efficient manner of movement? The vast majority of insects use the alternating tripod gait for a reason: By planting three legs on the ground, and then by swinging the other three legs forward, insects have developed a highly efficient and stable manner of forward movement. So, for the dung beetle to abandon this technique in favor of the galloping gait, there ought to be a really good reason. And indeed, it may have something to do with its favorite hobby, poop collection. Now, it’s important to note that not all dung beetles move with this gallop. It’s only been observed in three species of Pachysoma, including endroedyi, hippocrates, and glentoni. Unlike most dung beetles, who gather fresh poop and roll it along the ground, Pachysoma likes to gather bits of dry dung and hoard it in a nest. This requires the dung beetle to make repeated foraging trips instead of one epic journey. 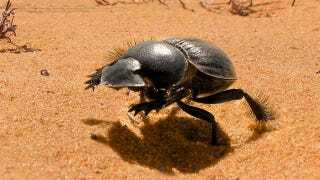 Subsequently, researcher Marcus Byrne of the University of Witwatersrand, Johannesburg, speculates that these dung beetles altered their mode of navigation because it helps them find their way back and forth from their nest. Pachysoma’s gallops are very well measured. So it’s conceivable that they’re somehow “tracking” and estimating the return distance from the food to the nest. And when it gallops, it slips less in the soft sand. This isn’t as outlandish as it might appear. Both bees and ants use similar techniques to find their way back home, using optical flow and the number of steps taken (respectively). Similarly, because the dung beetle has two eyes on each side of its head — one at the top and one on the bottom — Pachysoma may be using optic flow with its bottom eye over the sand. And like the ant, it may also be tracking its steps, or in this case, gallops. As an interesting aside, some dung beetles use the Milky Way for navigation. With that in mind, it’s hardly a stretch to suggest that this particular species is using another highly specialized navigation technique. Top photo: University of Witwatersrand.